The best part of hosting My Imaginary Talk Show versus hosting a real one is that I don’t have to do any of those ridiculous segments where a producer forces me to don spandex and attempt the latest exercise craze in front of my live studio audience. Trust me. No one wants to see that! First of all, I’m pretty sure I have an undiagnosed spandex allergy, which causes me to have panic attacks at the thought of wearing that devil fabric in public. Secondly, I have all of the coordination you might expect of someone who grew 7 inches in one traumatizing year. It was 1982 and I still haven’t forgiven puberty for what it put me through. But, if I had a live studio audience hanging out in my bedroom on cold winter mornings, they would see me “working out” to some pretty basic walking videos on YouTube in LuLaRoe leggings, wool socks, and a t-shirt that’s nowhere near long enough to cover all of my business because of that traumatizing Year of the Growth Spurt. It’s true, I fairly well mastered walking sometime in the late 60s. By the 70s, I had advanced to skipping and general frolicking. The 80s and its unprecedented height increase brought about an unprecedented increase in tripping incidents, but I eventually got over most of that. Now, in 2017, I find myself entering “once monthly Boniva” territory and I refuse to lose the bit of sinewy muscle I have managed to build on my Olive Oyl physique just because Old Man Winter has made the thought of traipsing through my neighborhood particularly unappealing. I asked my go-to group of women for some suggestions of non-embarrassing workout regimens and a personal trainer friend pointed me in the right direction. Now, on frigid mornings, I only walk outside long enough for the dog to do his business and then high-tail it home to do what I think of as “remedial aerobics”. No, it isn’t all walking in place. 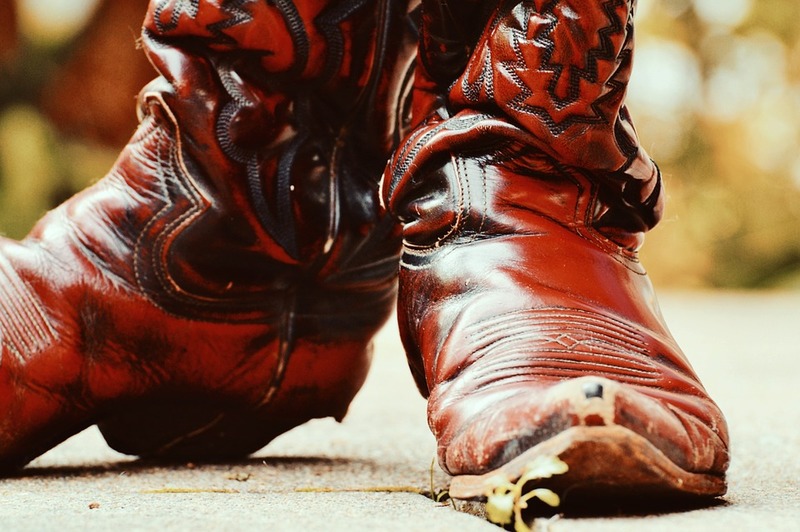 There are “power kicks”, side steps, toe taps, kick backs (not to be confused with power kicks), and the occasional grapevine, which is the extent of my coordination. There’s also junk to do with your arms. The instructors are so awfully gosh-darn supportive! (“If you lose your place, just go back to walking.”) It’s as if I have finally begun to heal from the trauma that was the Presidential Fitness Test! Forty-five minutes equals about a three-mile walk. I do as much as I have time for. Some days, I roll out of bed early enough to squeeze in the equivalent of 8 miles. My favorite is a 15-minute “Happy Walk” with an instructor and a class of spandex-y people who seem truly happy that I’m out there clomping around in my wool socks. They’re the sort of people I would avoid in real life, but, they’re inside YouTube and can’t hurt me. If I mess up, no one laughs–except maybe my dog who goes back to bed after he’s done his business. He’s no parkour dog himself, so I don’t care what he thinks of my foray into the Wide World of Not Really a Sport. 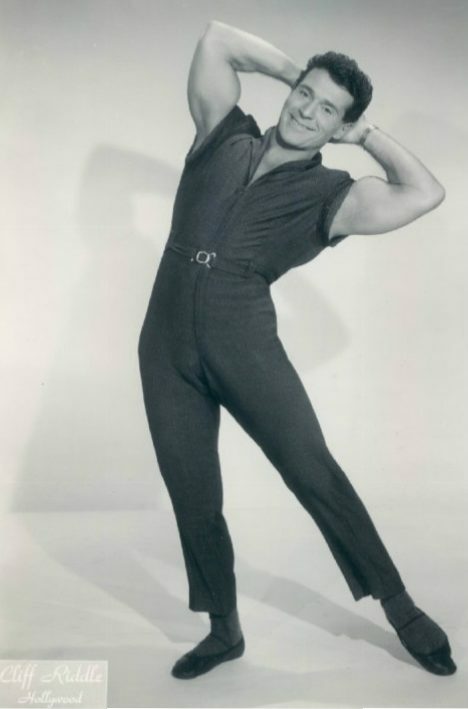 People who mastered walking in the late 60s are old enough to remember Jack LaLanne, whom, if his website is to be believed, was the Godfather of Modern Fitness. Before he started selling the juicing machines my father always felt compelled to order, Jack LaLanne was out there teaching the world how to exercise. He opened the first ever modern gym, back when people wore grey sweatsuits instead of jazzy spandex. He also preached nutrition to anyone who would listen. My family loved watching him. We’d curl up on the couch with a box of crackers and a can of squirt cheese and watch him do things like swim from Alcatraz Island to Fisherman’s Wharf, handcuffed and shackled, and towing a 1,000-pound boat behind his 60-year-old body. Sometimes he even motivated us to get off the couch. 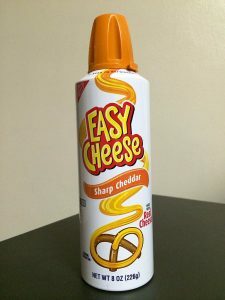 My father, who loved crackers and squirt cheese a lot more than he ever loved fresh juice once ordered the Slim-Gym exercising machine. (Yes, you might say my father had an issue with ordering things he saw advertised.) 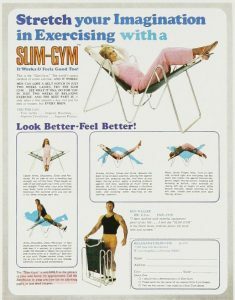 The Slim-Gym looked sort of like an old army cot that would fold up on you, forcing you to use your abdominal muscles to unfold it. I loved that thing! I’m not sure how much it contributed to my family’s fitness level, but I can practically still hear my father huffing and puffing away as the Slim Gym squeaked up and down. Squeak, ugh, squeak, umph, squeak, ugh, squeak, umph. Ah, the sounds of childhood! No doubt, my father would have never done something as ridiculous as a YouTube walking video–unless, of course, it was selling something. But I still sort of feel like he’s with me on those cold mornings–eating squirt cheese and wondering where someone might go to purchase spandex.